Payment by Interac.com only. No credit or PayPal payments at this price. A great two-person package with a canopy to protect you from the elements. 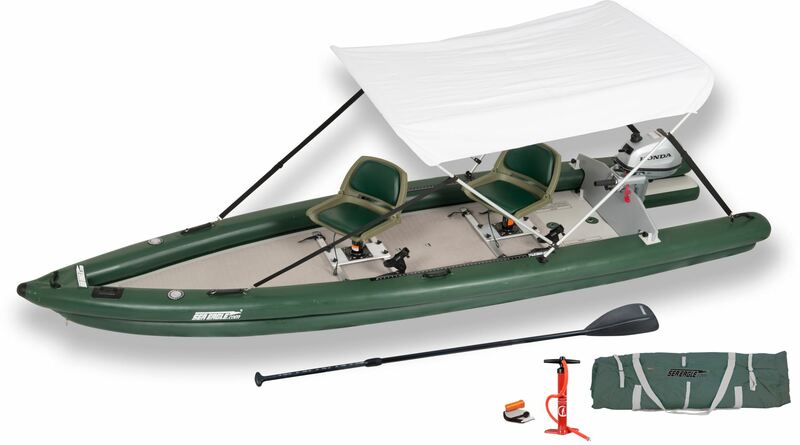 Featuring: 360° Swivel Seat Fishing Rigs with two Universal Scotty Rod Holders, a SUP paddle, and a sun/rain canopy. NEW PATENT-PENDING REVOLUTIONARY "Roll Up & Stow - Unroll & Go" 16' one or two person INFLATABLE FISHING SKIFF. Simply rolls up and stows. Fits in a car trunk ready to go! Comprised of entirely drop-stitch technology like that of inflatable stand up paddle boards. Giving you all the benefits of a rigid hull minus the excessive burdens and added cost. No trailer, no ramps, no expensive fuel cost, no maintenance, no storage fees! The Honda Motor Package is decked out with every angler's needs and with a 5 hp outboard will zip you around from one spot to another at up to 17mph. Then quietly slip into prime position by using a trolling motor, paddle or push pole. From skinny water to deep water and everything in between. The FishSkiff™ is a REVOLUTIONARY INFLATABLE FISHING MACHINE! The PATENT-PENDING Sea Eagle FishSkiff™ provides you with a NEW and REVOLUTIONARY APPROACH TO FISHING. Increase your catch and target those extremely hard to reach trophy fish! Without the hassles and added costs associated with rigid hulls. A superior inflatable craft that requires no trailer and can be fished everywhere from skinny to deep water and everything in between. Completely inflatable, portable, storable, and transportable. The FishSkiff™ can be stowed in the back of most cars and in relatively small spaces because it has no frame. It doesn't require a trailer so you can carry it to the most remote, hard to reach locations where fish hide most! The hull design truly maximizes speed, handling, performance, stability, fuel efficiency and most importantly safety. Nearly unsinkable and completely self-bailing with three separate independent large air-filled chambers. The FishSkiff™ will support an incredible amount of weight yet draft as little as six inches of water. ROLL UP & STOW - UNROLL & GO!